GoodReads: Once, only her own life hung in the balance. I love The Study trilogy, so when I heard that there was going to be three more books coming out I was really excited. However, if I'm being honest despite loving Valek, Yelena & the gang I was also a little worried, because sometimes completed series' are best left alone, in my opinion. The reason I say this is because in the past I've had experiences where I've enjoyed a completed series only to find there are going to be more books, and then when said books end up being disappointing it ruins my enjoyment of the whole series. I'm happy to report, however, that that wasn't the case here! The plot was fast-paced and action packed as usual, and it was great seeing both old and new characters emerge throughout the story. Prior to reading this I decided to re-read the Study trilogy, which I'm glad I did as it helped refresh my mind on the characters and world. There are several references to the events and characters from the Glass trilogy, so if you have read that trilogy it will help you understand said references. However, as someone who hasn't read it I didn't feel lost. I still understood what was happening, so, I don't think you necessarily have to have read it to get the gist of what is going on. Shadow Study alternates between Yelena's and Valek's POV. It was interesting learning about Valek's past and getting his thoughts on some of the events of the previous books. It made my love for him grow if that's possible. In Shadow Study Yelena is under attacked by unknown enemies and to make matters worse her magic has been blocked. Valek is also busy trying to undercover the culprits behind some black market trading. The book opens with them together, but shorty after the action kicks off they go their separate ways. 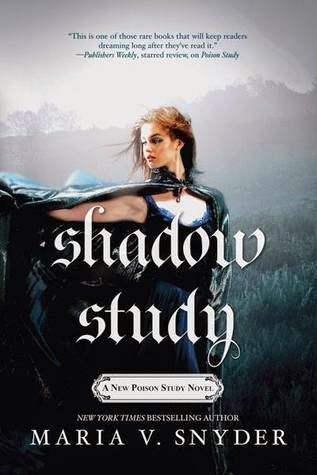 Which leads me to my next point...In Poison Study Yelena and Valek are together for the majority of the book, but in the books that follow they are separated for most of it. As much as I love how strong they are independently I would love to see them working together in future books, as opposed to being apart for most of it and only joining together towards the end. I can't really remember most of the Study trilogy anymore but I did like Valek and Yelena so I'm looking forward to this one's release. I'd like to see the two of them working more together too.